The greenest government yet? Maybe. This will mean nothing though unless Cameron regains control of his rogue MEPs in Brussels who are threatening to scupper any chance of an ambitious climate change agreement. The coalition agreement states “We will push for the EU to demonstrate leadership in tackling international climate change, including by supporting an increase in the EU emission reduction target to 30% by 2020“. Equally, David Cameron has repeatedly used climate change as a tool for his PR machine to soften the Tories image. He is facing embarrassment tonight then when a number of his MEPs are vowing to vote against any move to increase the EU emissions reduction target. 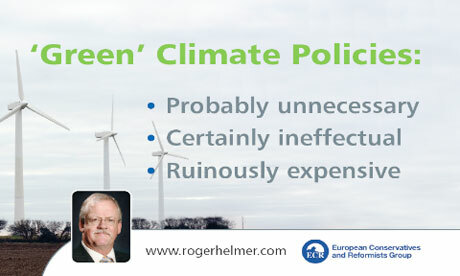 Once again, Tory MEPs like climate change sceptic Roger Helmer are running riot and putting us all at risk. As it stands, these few rogue ECR MEPs have the potential to make or break an EU deal which will affect us all. You might recognise Helmer’s face from a previous blog. It is irresponsible for Cameron to let his MEPs run riot. He must, without delay, implement a bit of party discipline and accountability. If he doesn’t it is not only the Tories that will suffer, but all of us who need a binding EU deal to help reduce our chances of facing the worst consequences of climate change.